In terms of impact and overall contribution to a structure, a door is usually underestimated when considered solely as a means of entry to a dwelling or a boat. More than a simple entranceway, a door can symbolize authority, security and beauty, making a lasting first impression on a guest or visitor. When crafted with intent and executed properly, the door to a beautiful structure or vessel can shine as the crown jewel it’s meant to be. The Introduction to Custom Door Making program is an intensive, hands-on five day course that covers door structure, aesthetics, materials and techniques for building a custom door that can fit any conventional and non-conventional opening. 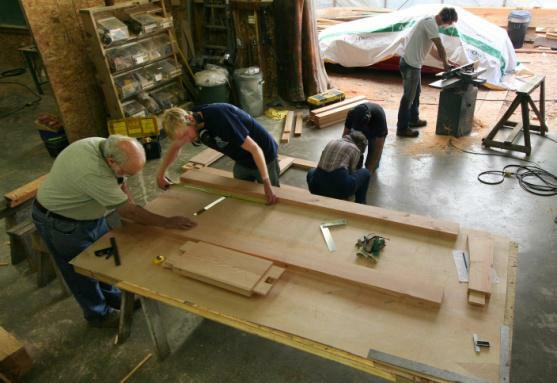 Pre-requisite courses: This course is not geared toward beginning woodworkers, therefore an Introduction to Woodworking course, or equivalent woodworking training, is recommended. Tuition and Class size: $850 per five day course. The minimum number of students for the class to run is 2 to a maximum of 6 students. Materials and tools: Some personal hand tools needed; student tool list provided with the registration package. The school will provide all other hand/power tools and machinery necessary, as well as a printed or PDF version of the course handouts. Materials fee: $150 for wood and materials; however if the school keeps the end project the extra fee may be waived.